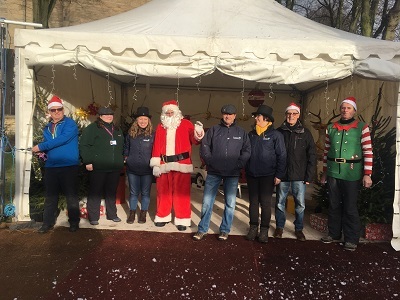 The Rotary Club of Lincoln again provided the official Lincoln Christmas Market Santa in the grounds of Westgate Water Tower. The objective was to provide the opportunity for families to meet Santa with any donations going to charity. Thanks goes to Anglian Water for use of the Tower and it was great to be accompanied by a team from Anglian Water providing information and demonstrations associated with their activities. Santa greets the Rotary elves and the Anglian Water team. 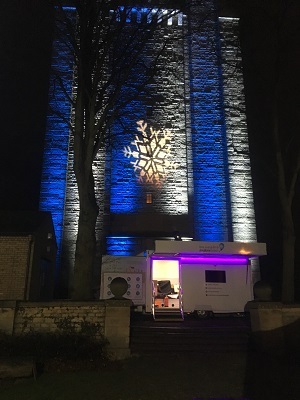 An additional thanks to Anglian Water for providing the atmospheric lighting on the water tower, which as well as being extremely effective was a fitting memorial to a member of staff Kevin Moody from the Grimsby Fleet team. 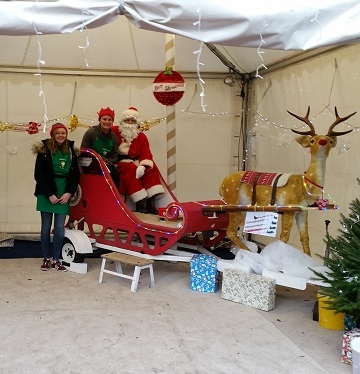 Thanks also goes to students of the University of Lincoln who helped out as elves. The two second year pharmacy students (shown) were the first of a number of helpers.